Over the last several years, the California Attorney General’s Office (OAG) has released annual reports of Proposition 65 settlements through 2017. These reports make one thing clear – Proposition 65 continues to be a lucrative source for private Proposition 65 claimants and their lawyers, as the total settlement payments continues to rise through the years. In the past, we noted that private Proposition 65 claimants and their lawyers collected at total of $17 million in settlement payments (comprised of civil penalties, “PILPs” or “Payments in Lieu of Penalties” [also known as “Additional Settlement Payments”] and attorneys’ fees and costs) in 2013, and $20 million in 2012. The trend since then has been upward on all fronts, with one notable recent qualification regarding PILPs. Proposition 65 contemplates that private claimants will share any civil penalties collected, with 75 percent going to the California Office of Environmental Health Hazard Assessment (OEHHA) and 25% being kept by the private claimants. However, Prop 65 claimants are allowed an alternative remedy of PILPs, in which the claimants can pocket 100% of the PILPs and share nothing with OEHHA. All private claimants needed to do is establish that the PILP payments will go to fund some kind of activities with a nexus to the basis for the litigation, and show how those funds would be spent. Until recently, this was not a big obstacle for Prop 65 claimants. As can be seen from the OAG reports, many Prop 65 claimants are special-purpose entities that contend their own business of pursuing Prop 65 claims serves the environmental interests they are trying to protect through pursuit of more Prop 65 claims. As a result, these entities could pocket the PILP money to self-fund their own activities to make more Prop 65 claims. Being able to keep all of the PILP money, rather than the alternative of having to give 75% of civil penalties to OEHHA, undoubtedly made PILPs very attractive to Prop 65 claimants. Perhaps the only bright spot in the chart below is the significant reduction (by more than 50%) in PILP recoveries, which followed an amended regulation that went into effect on October 1, 2016 to tighten requirements for PILP settlements. We’ll develop more on this amendment and its effects in a future blog post. Finally, but clearly most significantly in terms of dollars spent on settlements of Prop 65 claims, private claimants’ lawyers are entitled to recover reasonable attorneys’ fees and costs. 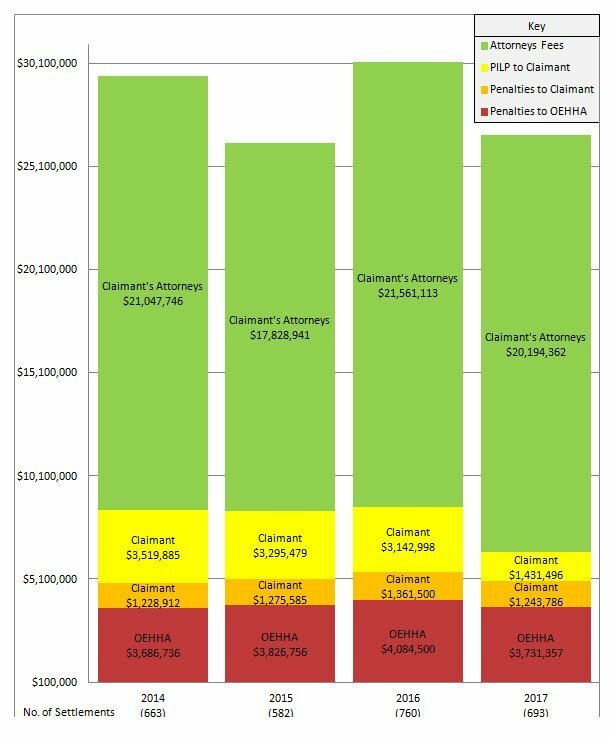 As seen in OAG reports, and displayed graphically below, this attorney fee recovery constitutes by far the largest portion of Prop 65 settlements. When viewed graphically, it becomes all the more evident that the vast majority of Prop 65 settlements benefit claimants and their lawyers, not OEHHA or any other government agency charged with protecting the public. Questions must arise whether this was really the intent of Proposition 65, however beneficent was its purpose. 2016 was the biggest year for Prop 65 private claimants, according to data released by the California Attorney General’s Office. In 2016, private claimants settled 760 cases, suing smaller businesses and larger entities like K-Mart, Michaels, Williams-Sonoma, and Twinings. The settlements for that year totaled over $30 million. Of the $30 million collected in settlement payments in 2016, attorneys’ fees made up more than $21.5 million, or 71.5% of all private settlements. In addition, while civil penalties amounted to just over $5 million, or 18% of all private settlements, private claimants can take 25% of any civil penalty assessed as a “bounty.” In 2016, the civil penalties retained by claimants represented a sum of $1,361,500, or 4.51% of all private settlements. PILP money made up 10.42% of all private settlements. That means approximately $3.1 million landed in the hands of private claimants and their attorneys, in addition to the attorneys’ fees and civil penalty bounties they received. A few firms did particularly well that year. In 2016, The Chanler Group brought in 242 settlements for over $7.4 million. 83% of this figure, or over $6 million, was paid out in the form of attorneys’ fees and costs. Brodsky & Smith brought in 99 settlements for nearly $2.5 million. 90% of the nearly $2.5 million, or $2.2 million, in settlement payments went to the lawyers as attorneys fees and costs. Some claimant representatives obtained settlements that were not quite as disproportionately in favor of attorneys’ fees and costs. For example, the Center for Environmental Health brought in 93 settlements in 2016, for a total of $4 million, broken down as follows: 11% as non-contingent civil penalties, 16% as PILP payments, and 74% as attorneys’ fees and costs. Similarly, the Consumer Advocacy Group brought in approximately $4 million across 71 settlements, recovering 11% as non-contingent civil penalties, 14% as PILP payments, and 75% as attorneys’ fees and costs. The Environmental Research Center brought in 55 settlements for nearly $5 million, and the breakdown of payments was split more evenly: 36% as civil penalties, 31% as PILP payments, and 33% as attorneys’ fees and costs. In 2017, private claimants continued to pursue Prop 65 claims, settling or obtaining judgments in 693 cases. The recoveries totaled more than $26 million. As can be readily seen in the chart above, although the total claimants’ recoveries were somewhat lower, they were on par with 2015 recoveries. Further, attorneys fees were proportionately even higher in 2017 than in preceding years, and the reduction was primarily in the PILP recoveries. Attorneys’ fees made up more than $20 million, or 76% of all private settlements, and civil penalties retained by claimants represented an additional $1,431,496 or 5.4% of all Prop 65 recoveries. If these trends continue, total Prop 65 settlement payouts will continue to rise, imposing the “unnecessary burdens for businesses” that “are cause for public concern,” as the OAG noted in 2014. Conkle, Kremer & Engel routinely represents businesses against Prop 65 claims and lawsuits brought by private claimants, and works with businesses to develop compliance strategies to minimize the risk that they will be future targets of Prop 65 claimants.